A sweet siren song echoes through the air from a small backyard shop in Arnold. Between tiny wall and window cracks, the song spills out over the gray landscape, painting it a new life of crystal blue, white sand and coconut palms. Here musician Kevin Martin pursues his passion by building instruments styled after drums from the faraway shores of Trinidad. The love affair began at Cornell University. While studying finance and international trade, Martin was turned on to calypso by his brother Sean. He fell hard for the steel pan drums. "I just thought the steel drums sounded so bright and positive," says Martin, "I fell in love with them immediately." The smitten aspiring financier could find no drum to call his own. His solution: build one. He discovered an old book by Pete Seeger called Steel Drums: How To Build and Play Them, gathered the materials and went to work. "My brother and I got a 55-gallon steel barrel and beat the crap out of it in our basement," Martin explains. Then we burned it over a bonfire in the back yard. Then we tuned it with a friend's ear and a keyboard." The result was a crude but playable steel drum - and a defining direction in Martin's life. "I knew from then on, I wanted to be an instrument builder," says Martin. 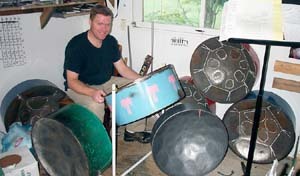 Today, after a decade of trial and error, blood, sweat, burns and a session at The University Tuning Project Steel Drum Camp in West Virginia, Martin is fine-tuning the science of steel-drum construction. He describes the building process as a "three-dimensional, mathematical Rubik's Cube, that is translated into the physical." While manipulating his cube, Martin has taught himself Music Theory, Geometry and Metal Shop 101. Nowadays, he's streamlined the trial-and-error method he and his brother pioneered. 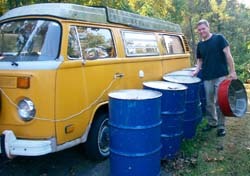 Martin starts with a 55-gallon food barrel. Next, he bolts the barrel to the floor, strips the paint off the flat bottom and marks it with concentric circles. He then uses a series of multi-weighted sledgehammers to pound the flat surface into a bowl. Now comes the music. Martin circumscribes the position that will become each note on the bowl and isolates each by bending the metal into individual bubbles that he then grooves around with a filed nail punch. 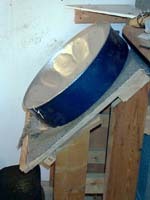 Next he burns the drum over a fire to strengthen the metal and realign its stresses. After "firing the octaves," he quenches them with cold water. Finally, he taps out the tonic, harmonic and octave notes with a hammer and tunes them with a strobe tuner. Each drum demands about 80 hours. From steel, pounding sledgehammers and fire rises an instrument with a sound capable of inducing hypnosis. As both a musician and a builder, 32-year-old Martin has watched the pans evolve. Steel drums are a new instrument, no older than 60 years. They originated in Trinidad as an instrument of poor musicians who transformed discarded barrels into drums to accompany their songs and stories. Ironically, this instrument of meager beginnings now costs as much as $3,000 brand new in the states. Martin hopes to be selling his instruments this year. "I would like to manufacture and make this a business, but playing music will always be at the center of my life." Building the drums and playing them are linked, Martin explains. "To build an instrument and play it, you have a close connection to it. Playing makes you a better builder and building makes you a better player." Martin taps liquid-metallic notes from an underwater dream at the center of two local bands. He sings and plays the lead pan in the High Tide Steel Drum Band, an aquatic flavored quintet that ranges from traditional calypso to clever interpretations of reggae's Peter Tosh. Martin would like to see the drums travel from the traditional island sound of calypso and onto different musical shores. "It would be cool to see the steel drums used in punk rock or something," he says. As a virtuoso, singing, playing guitar and the lead pans, Martin fronts the all-original Geckos, whose style is a mix of rock 'n' roll, blues and a higher tempo reggae called "rock steady." Playing gigs at night pays for Martin's new "school," the time he spends learning in his shop. You can catch the Geckos every Wednesday night at Acme Bar and Grill. Both the Geckos and High Tide Steel Drum Band have CDs on sale in local music stores. Learn more about the steel drums on the High Tide Steel Drum Band's web site at www.steeldrumband.com.